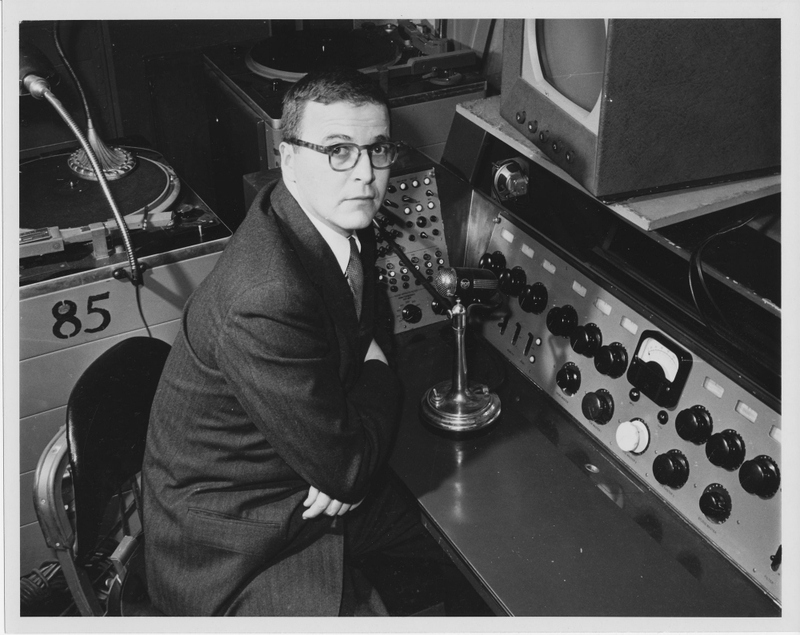 One of the largest and richest of the WCFTR's collections relating to live television are the papers of producer and director Fred Coe, unquestionably one of the most important figures in 1950s American television. Fred Coe (1914–1979) was born in Mississippi and raised in Nashville, Tennessee. After two years at the Yale School of Drama and a stint in the Air Force during World War II, he started as a production manager at NBC in 1945. He advanced quickly, becoming in 1948 the producer of one of the longest-running and most prestigious anthology series, Philco-Goodyear Television Playhouse (a single weekly show that alternated sponsors). Coe's success and critical prestige with Philco-Goodyear afforded him the opportunity to move on to more expensive and ambitious anthology series, such as Playwrights '56 and Producer's Showcase. Initially directing many shows himself, Coe eventually turned over this role to a series of young directors. Although the earliest episodes often featured crude sets and rudimentary camera work and "live" editing, under Coe's guidance Philco-Goodyear, and ultimately the other shows he produced, developed a style of graceful, often complex staging captured by a quietly virtuosic moving camera. Under his mentorship, directors like Arthur Penn and Delbert Mann became masterful "actors' directors," preparing them for future successes in film. Coe likewise hired and worked closely with writers such as Robert Alan Aurthur, J.P. Miller, Sumner Locke Elliott, Tad Mosel, Stewart Stern, Walter Bernstein, Joseph Liss, and Paddy Chayevsky. Coe's tastes are partly responsible for the artistic prestige of the anthology drama. He was among the first producers to seek out original teleplays, rather than adapting properties in the public domain. His shows became known for tackling social issues, and letters in the Coe papers show that he often hit upon a powerful topic (mental illness, alcoholism, aging) and then solicited a script from one of his favored writers. Many of the original works produced by Coe later became well-regarded stage plays and films: Marty, The Miracle Worker, Requiem for a Heavyweight, Edge of the City, The Left-Handed Gun, and Judgment at Nuremburg, among others. Coe also produced adaptations of challenging works of modern literature: William Faulkner's "Old Man," James Agee's A Death in the Family. Internal network memos, private correspondence, and other documents in the WCFTR's Fred Coe papers provide evidence of his struggles with the corporate sponsors of his anthology series. While network executives were generally supportive of Coe's desire to address social problems, sponsors often complained of being associated with "depressing" shows. R.J. Reynolds, makers of Camel Cigarettes, nixed one project that took place largely in a sanatorium for victims of tuberculosis. Sponsors also gave Coe headaches by dragging their feet on approving scripts—a terrible frustration in a medium where producers were responsible for airing a new "play" once every week or two. After live television drama largely disappeared in the early 1960s, Coe moved into producing and directing for the theater and the big screen, often collaborating with his old television comrades. For instance, in 1962 he directed Herb Gardner's play A Thousand Clowns on Broadway and three years later directed and produced a film adaptation starring Jason Robards and Barbara Harris. He continued to produce "specials" for the television networks into the 1970s, even occasionally producing self-conscious revivals of live television drama. The Fred Coe papers include numerous documents pertaining to these later phases of his career. From Playwrights '54 to Playwrights '56 - The attempt by Coe and several anthology-drama writers to create a corporation to protect their interests is documented here. Playhouse 90 and the End of the Golden Age - In 1956, Coe jumped from NBC to CBS to produce Playhouse 90. The story of this most celebrated of anthology dramas is featured here. Jon Krampner. The Man in the Shadows: Fred Coe and the Golden Age of American Television. New Brunswick: Rutgers University Press, 1997.